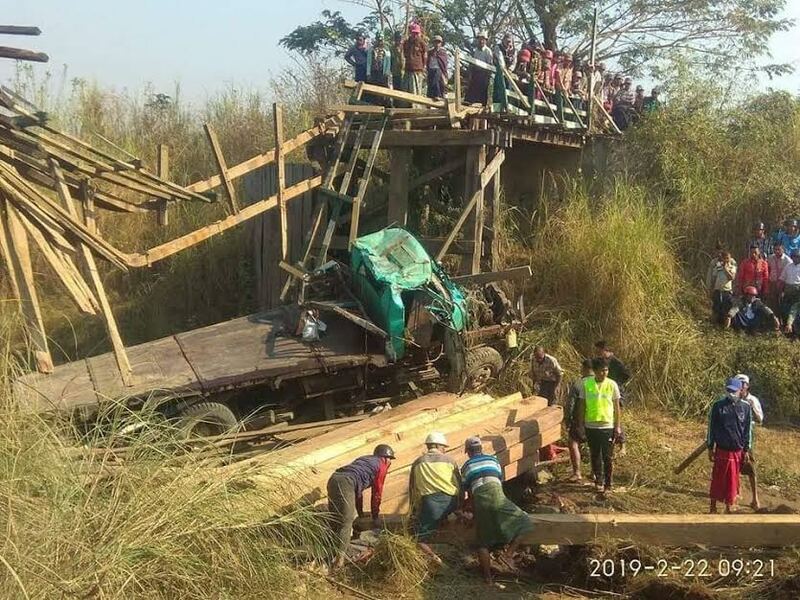 PATHEIN, Irrawaddy Region — A wooden bridge in Irrawaddy Region’s Ingapu Township collapsed early Saturday morning while a logging truck was crossing it, killing six people on board. The bridge, which spanned the Ma Mya Hpauk Creek along the Htoo Gyi-Shwegyin-Thaebyingon road in Htoo Gyi Town, had been declared dangerous by local authorities. Use of the bridge was banned and another had been built for crossing the creek. A six-wheel logging truck was crossing the bridge when it collapsed at about 1:30 a.m. Six people on board were crushed to death by the logs they were hauling. The driver and two other passengers were injured but survived. “The bridge is dangerous to use. So we had put up warning signs asking commuters to use the bypass,” police Lt. Col. Tun Shwe, of the Irrawaddy Region Police Force, told The Irrawaddy. He said it took firefighters almost nine hours to recover the dead bodies and that the injured were sent to the Hinthada People’s Hospital. Nyaungbingyikwin Village Tract administrator U Htay Aung said five of the dead were between the ages of 20 and 30 and that the oldest was 48. “There are warning signs at both ends of the bridge. When the truck reached the middle of the bridge, it could not bear the weight and broke down. Six of the seven people sitting on the logs were killed on the spot. The driver, who drove recklessly, is to be blamed for the accident,” U Htay Aung said. The Htoo Gyi police station has opened a case against the detained driver for causing the deaths. In a separate case on Feb. 10, a six-wheel truck carrying 2,500 bamboo poles plunged into a ditch in Irrawaddy’s Thabaung Township, killing seven people on board.